Since then, however, Trump and Putin have barged ahead with costly plans to replace and upgrade their massive nuclear arsenals. The bilateral nuclear relationship has gone from bad to worse. The July 2018 Trump-Putin summit in Helsinki yielded nothing, not even an agreement to resume “strategic stability” talks. The simmering dispute over Russia’s violation of the 1987 Intermediate-Range Nuclear Forces (INF) Treaty reached the boiling point in October 2018 when Trump said he would terminate the pact, which had eliminated an entire class of nuclear weapons. Worse still, the United States and Russia have not begun talks to extend the 2010 New Strategic Arms Reduction Treaty (New START), which caps each side’s deployed strategic warheads to no more than 1,550 and delivery vehicles to no more than 700. Without the INF Treaty or New START, there would be no legally binding, verifiable limits on U.S. or Russian nuclear arsenals for the first time since 1972. Because there is no realistic chance to negotiate a New START replacement by 2021, the logical step for both sides is simply to extend the treaty by five years to 2026, as allowed in Article XIV of the agreement. Putin has indicated he would like to begin talks to extend the treaty, but Trump remains undecided. Unfortunately, National Security Advisor John Bolton, who called for abandoning New START before he joined the Trump administration, is leading the ongoing interagency review on the treaty’s extension. Sources indicate Bolton, true to form, is pushing to nix New START. With the future of New START in jeopardy, members of Congress from both sides of the aisle need to step in and use the power of the purse to attempt to prevent Trump and Bolton from blowing up the last remaining U.S.-Russian nuclear arms control agreement and to bring nuclear weapons costs under control. To send a message to the administration, Congress this year should prohibit funding to increase the number of nuclear weapons above the limits set by New START, so long as Russia continues to stay below treaty ceilings. Such an approach would guard against a breakout by either side and help to maintain strategic stability. Congress should also take steps to challenge the Trump administration’s excessive nuclear force plans, especially if the administration is going to default on its obligation to limit and reduce excess Russian and U.S. nuclear forces. The Trump plans call for spending roughly $500 billion over the next 10 years to maintain and replace U.S. nuclear delivery systems and their associated warheads and supporting infrastructure, according to the Congressional Budget Office. This enormous and growing bill is unsustainable and unnecessary. According to a 2013 Pentagon assessment, U.S. strategic nuclear force levels are at least one-third larger than necessary to deter nuclear attack. More realistic and affordable options to maintain a credible nuclear arsenal can and should be pursued regardless of whether New START is extended. But Congress must also make clear to the administration that the evisceration of arms control is unacceptable. One option Congress could pursue is to freeze funding for the major nuclear delivery system and warhead modernization programs at today’s levels, which would force delays in the schedules for these programs. This would get the attention of the White House and Pentagon and put pressure on the administration to make the right decision on New START. If Trump is not ready or able to take the steps necessary to prevent a dangerous new U.S.-Russian nuclear arms race, Congress should be ready to do so. As national security professionals and public servants who have spent their careers working for and with Republican and Democratic presidents to protect our nation’s national security, we urge you to ensure that we sustain meaningful, verifiable limits on the world’s two largest nuclear arsenals in order to provide more predictability, transparency, and stability in our nuclear relationship with Russia. We have been deeply troubled by the unresolved problem of Russia’s noncompliance with the 1987 Intermediate-Range Nuclear Forces (INF) Treaty. In July, NATO members, including the United States, affirmed their commitment to the INF Treaty, stating that it was “crucial to Euro-Atlantic security.” We agree. 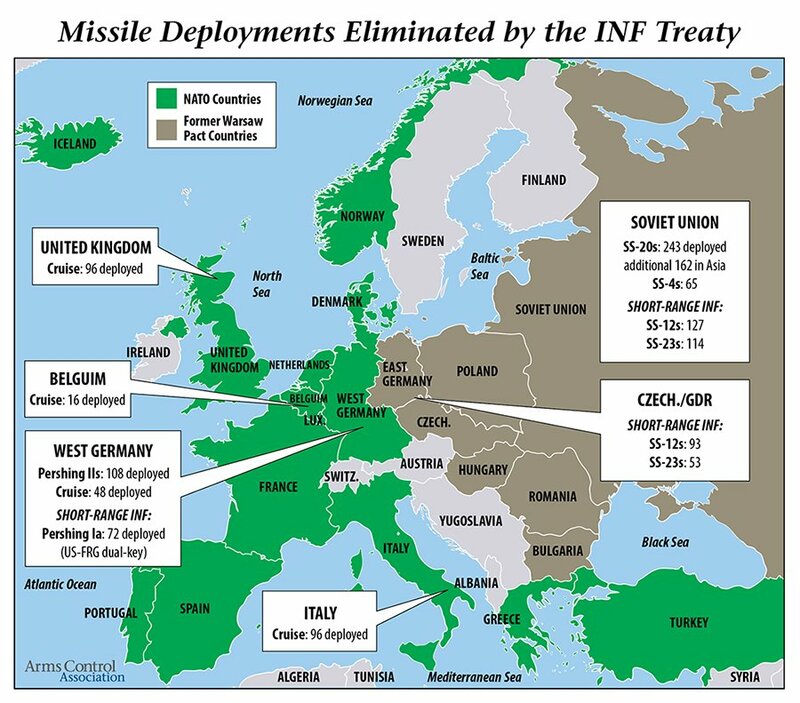 The INF Treaty has prevented the unchecked deployment of nuclear missiles in Europe, significantly reducing the risk of rapid escalation towards nuclear war. Rather than move to terminate the INF Treaty, however, we urge you to direct your team to redouble efforts to negotiate technical solutions to U.S. (and Russian) INF compliance concerns. Russia’s deployment of a prohibited ground-launched cruise missile must be addressed; Moscow is concerned that launchers at the U.S. Aegis Ashore missile defense sites in Romania (and the planned site in Poland) are capable of firing offensive missiles. A senior adviser to President Putin has said that Russia is still ready to address “mutual grievances” related to the treaty. We urge you to pursue this option. New START is due to expire on February 5, 2021 unless you and President Putin agree to extend it by up to five years (to 2026), as allowed for in Article XIV of the treaty. We urge you to take up Russia’s offer to engage in talks on the extension of New START. These talks should begin immediately to address any outstanding treaty compliance concerns before the treaty expires. With your decision to extend New START, the two sides would have the time necessary to work together on a new deal that addresses obstacles that prevented your predecessors in the White House from achieving further limits and deeper reductions in the two countries’ nuclear arsenals. Every American president since John F. Kennedy has successfully concluded at least one agreement with Russia to reduce nuclear dangers. Without New START, there would be no legally-binding, verifiable limits on the U.S. or Russian nuclear arsenals for the first time since 1972. In March of this year, you said you wanted to work with Russian President Vladimir Putin “to discuss the arms race, which is getting out of control.” We respectfully urge you to do so.